"Where is Columbine Creek, anyway?" we asked together. Doug Smith had just given Dan MacNulty and me the flight report, and it was not good. Rather than turn around and go back to their home in Pelican Valley, the far-reaching Crystal Creek Pack, residents of the parks high elevation interior, stretched their legs another dozen miles and headed south along the east shore of Yellowstone Lake. At last they stopped, but only after taking a cow and calf moose near the mouth of Columbine Creek. Moose, it seemed after our initial foray into Pelican Valley, is a favorite among the large carnivores of Yellowstones high plateaus. They wintered in pockets of thick forest, mostly spruce and pine, but certainly with lots of subalpine fir, a climax species that fills the understories of forests and provides the moose with winter browse. Nobody knows their numbers, but certainly most forested drainages holds a few. 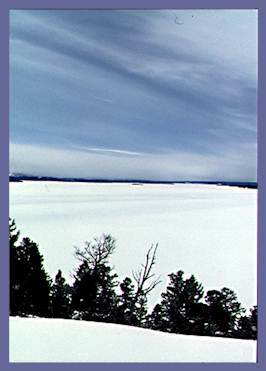 As Dan and I looked out over the incredible expanse of Yellowstone Lake, locked under ice and snow as it was, we noticed just how many of these forested drainages there were to detain the wolf pack, slowing their return to more familiar haunts in Pelican Valley. From our vantage over the lake, we contemplated our next move. If the pack had gone south to Columbine, they must have crossed or even followed the road at some point. After some careful looking we discovered their crossing point. After emerging from a thick forest, the pack crossed the road. A drag mark along the side of their trail belied the transport of some large object dangling from a mouth, occasionally dropping to swipe the snow. This was likely a large bone, and that meant a kill had to be somewhere near there. Strapping on our snowshoes, we were determined to explore this area of thick forest and discover this supposed carcass. It was a refreshing change to track wolves in this environment. More familiar wolves like the Druid Peak or Rose Creek Packs will travel in the higher country, but mainly they traverse the sagebrush grassland environs of the northern range. There their trail becomes hopelessly entwined among elk and bison tracks, lost along hills of snow-free area, and otherwise obscured by the wind and sun that keeps those areas so habitable. Among the towering trees and moss hangings, the tangled branches and waist-deep snow, we picked our way along a perfect track for miles. Back-tracking one set of trails quickly turned cold near the top of a high butte. Stymied, we returned to the crossing and meandered back along the road for further tracks that we happened on not far down the road. It appeared the pack had paralleled this section of road. When we came to the section of road that met the edge of Yellowstone Lake we found our track had ended, indicating the pack had used the road for some distance,and their trails had long-since been erased by snow machine traffic. Following the road north we noticed more wolf trails coming and going from the road, mostly where the road passed through thermal areas like Steamboat Point and Mary Bay. In the afternoon, we returned to the crossing and forward-tracked the pack for a few miles through the old growth forest. The drag mark that at first suggested to us there was a kill somewhere was easy to follow for some distance, but it did diverge from the wolf tracks to reveal that it was a coyote that held the scraping object in its mouth. Not much further did we follow the smaller tracks to find a small bed among a thick stand of fir, and the front leg assemblage of a moose, picked clean. Dan went back to Lake Village to report our findings to Doug Smith while I stopped at Fishing Bridge to watch the sunset. From the bridge, I watched river otters playing along the icy rim of the Yellowstone River. At first there were two, but as time went on, a third and then a fourth otter swam up from the lake, was greeted by the others, and then play resumed. They wrestled around extensively, occasionally changing the site of their merriment by hopping into the water and swimming downstream in a perfect line of four. They ended up at a large cornice that bulged out over the river. Several holes allowed them within the cornice's interior, like the multiple entrances to a fort. The "cornice castle" I called it, a perfect home for several otters. They were active past dark, one moving clear down under the bridge. I could no longer see it, but I could hear distinctly its splashing and snorting, directly beneath me. My thoughts were then, "even if I don't catch up to these wolves, it sure has been worth the effort..."
The presence of a moose carcass, not yet found, weighed upon our thoughts that night. At some point between finishing the dishes and sipping my nighttime tea, I announced to Dan I knew where the carcass had to be. We had back-tracked all trails but a small section, maybe a quarter of a mile that paralleled the road, and it was along this section that we would find the moose. Within a deep gully, only a couple hundred yards from the road, we, indeed, came across the remains. 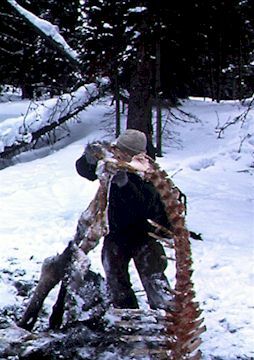 The bones of a cow moose, minus one front leg assemblage, were scavenged thoroughly. Wolf tracks in the area and some blood stains in the snow suggested there had been a battle. Interestingly, we found the condition of the moose including the bone marrow to be healthy, in contrast to the moose the grizzly had taken in Pelican (see Chapter 1). Perhaps this animal had been ambushed by 15 wolves and within this tight gully, was unable to escape. Not only did we find the moose right where we had deduced, the mornings work also produced the signals of the Crystal Creek Pack. From our vantage over Yellowstone Lake we were receiving telemetry signals from the pack, seemingly taking the same route back from Columbine Creek as the route they had taken to get there. They remained in the same area until dusk, when signals indicated the pack was moving up the drainage toward the east entrance. This direction made us uneasy, for if they kept to this route, they would be over the divide and out to the Middle Fork of the Shoshone River where they could stay for weeks hunting elk (for a change). That night we returned to our lodging wondering if this was the end of our expedition. If they go to the Shoshone, our goals of seeing them in the open expanses of Pelican Valley would be in jeopardy. Surely they would return to Pelican at some point, but would they wile our limited time going to these other, more inaccessible places first? The next morning would hold our answer. In the crisp air of our fourth morning we got signals for the pack from our jumping off point to Pelican Valley. The battery of the receiver died, so Dan went back for another before he could be certain of their location. Meanwhile, I ventured on to see if there were any tracks. Tracks covered the road. Printed in a fresh dusting of snow from the previous evening, a horde of wolves had passed this way, mainly using the road. 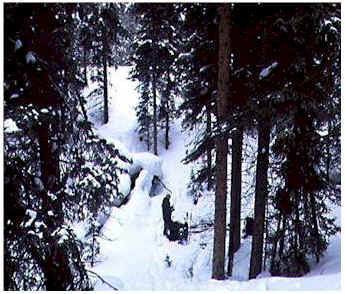 The tracks were so ideal I was able to follow them on my snowmobile up the road for miles. They rarely left the road except where there were thermal areas, and at these places they made excursions. The bison that inhabited these refuges showed no outward indication of a recent battle with wolves, but certainly the tracks told of much testing of the bison by the wolves. A few bison were lying on their sides, tired I thought, but it was nott anything unusual for these steadfast individuals. Continuing on, I found the pack had made a run through the Steamboat Point area, checking old bison carcasses, scent-marking on the bases of road signs. When the pack came to Mary Bay, they turned inland and their tracks disappeared. At this point, there could be only one place they were going, back to Pelican Valley.